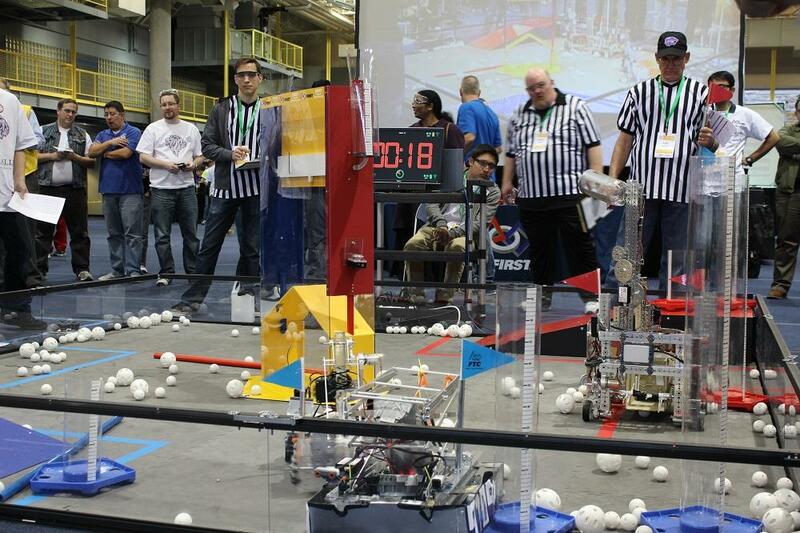 Student built robots attempt to capture wiffle balls and put them in tall bins at the FIRST Tech Challenge qualifier. Olathe Northwest High School junior Nick Rodriguez makes a last minute check on his team's robot. 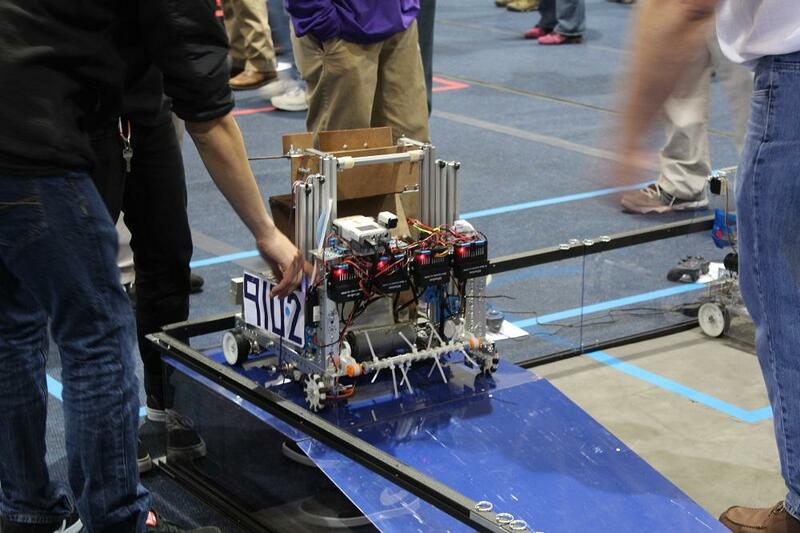 Olathe Northwest's robot up close. Nearly 500 students from the Kansas City metro area competed in the For Inspiration and Recognition of Science and Technology, or FIRST, Tech Challenge qualifier Saturday. Thirty-seven teams of middle and high school students filled UMKC's Swinney Recreation Center. 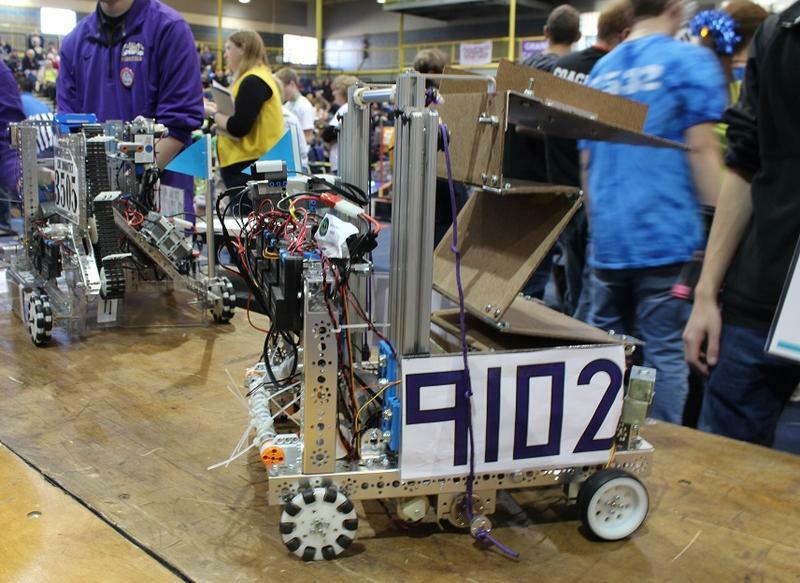 Each team brought a small remote-controlled robot to roll around small arenas. The students guided their robots to try to collect Wiffle balls and place them in tall bins. 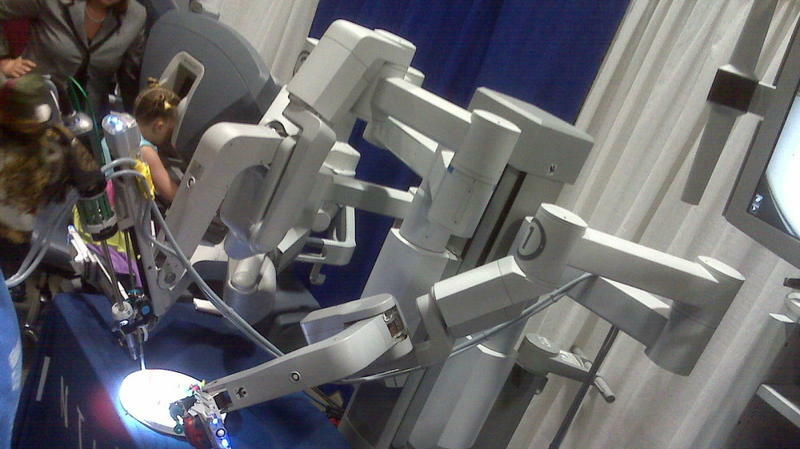 The process to make the robots is a long one, and teams work for weeks to get everything just right. Sam Converse, a middle-schooler in the "Red Hot Techie Peppers" team from Kansas City, Mo., says the Peppers started working on their design five months before the competition. "It takes about a week to start designing what we're trying to get," Converse said. "And then it takes maybe another week to build what we're doing, and then a few more weeks to refine it to make it how it is today." Nick Rodriguez is a junior at Olathe Northwest High School. He says his team was making adjustments to their robot up to the last minute. "We were at our school until at least 12:30 last night trying to finish it up," Rodriguez said. "So we are probably running on four hours of sleep or less, and it is an awesome time." The top six qualifying teams will move on to the FTC Missouri State Championship at Missouri S&T in March. 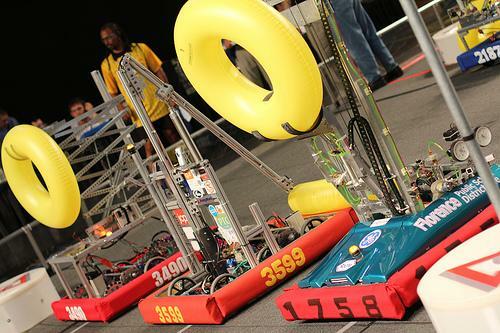 It seems like we depend on machines for nearly everything we do, and a whole new breed of mechanical wonders is invading Kansas City this weekend for the 2014 KC Regional First Robotics Competition. On Friday's Up to Date, we talk about the competition that's attracting more than a thousand high school students who have designed their own robots. A family visit to the USA Science and Engineering Festival in Washington this weekend drove that point home again and again.